You’ve probably heard this before, and if not, it’s so true, right? Everyone from Theodore Roosevelt to modern leadership trainers have been credited with the phrase. It is the basis of quality coaching and teaching. I’ve been a fitness and personal development coach for more than 15 years. I think it’s fair to say that even if my clients don’t achieve the success they had hoped for, while working with me they will always know that I genuinely care. They know I did my best to help motivate them and direct them towards their goals and a healthier, more balanced and focused lifestyle. I’m a firm believer in this principle – it is my foundation. When it comes to coaching, leading, marketing, social influence, as well as everyday interactions, being genuine, open, and attuned to others is what encourages people to open up. When you engage with people at work or home are you giving them your best self? Or are you leading conversations, meetings and requests with a hollow, rushed, or self-serving agenda? If so, try connecting to them with open-ended questions that build on each other, with curiosity and positive body language. 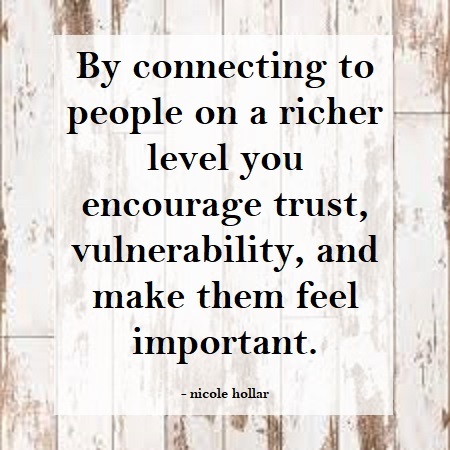 By connecting to people on a richer level you encourage trust, vulnerability, and make them feel important. It is from this space that people learn to appreciate, trust, and value your knowledge.